Hello! I'm trieng to boot from usb an is image made with aero. When i boot from the stik it looks like in the pictures show'ed bellow! I tried on 4 computers and same thing! Please help me with somme tips! Tx a lot and congratulation for your work! Would you please tell more about your project? How about try the qemu shiped with aero studio? 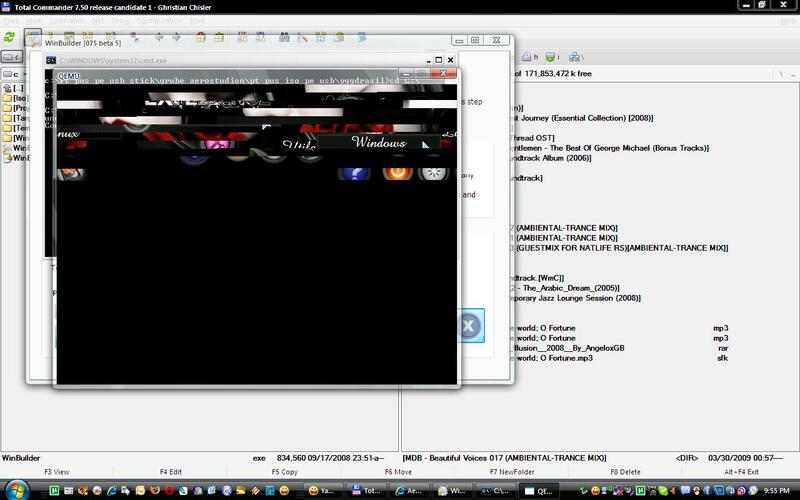 maybe, the video driver of your qemu is not so proper. if you have no idea about the qemu, try Virtulbox or VMWare. tx for your replyes guys! So my project is an multi boot cd/usb Windos(install and live cd/usb)Linux(damn small linux, puppy linux and Linux live hacking)and Utils(erd commander, WAREZ, acronis). If i burn my projec on cd it work 100%, but when i put it on usb in qmenu it starts like in the pictures showed bellow, and whene i restart and boot prom usb it want start, it opens and blank black page and thats all! creating is different process than other projects. and if every thing goes OK i will upload that as a tutor in "Tutorials"
section of this site (About 10 days later). yes i know that they have diferent boot. 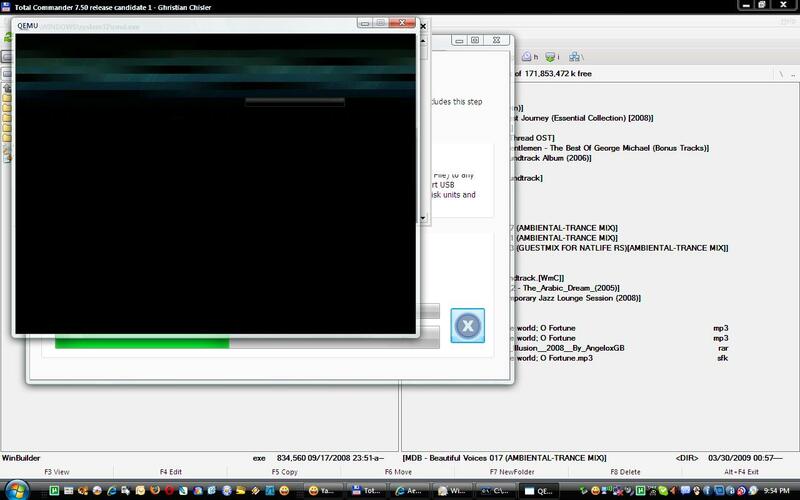 but my problem is that this iso that i made it work on cd/dvd. i burned it on dvd and it work. it doesnt work when i put the iso on stik it look like in that pictures when i load in qmenu or wm and when i restart and boot from stick it boots, i enter the password and then a blank black image appear and doesnt do nothing!! !thats my problem!